Once upon a time, there lived a frog prince. Cursed by a wicked witch, the frog waited for a kiss from a beautiful princess, which would turn him into a handsome prince. One fine day, a lovely princess would find him, but - the frog died of chytridiomycosis caused by a pathogenic fungus, Batrachochytrium dendrobatidis (Bd). 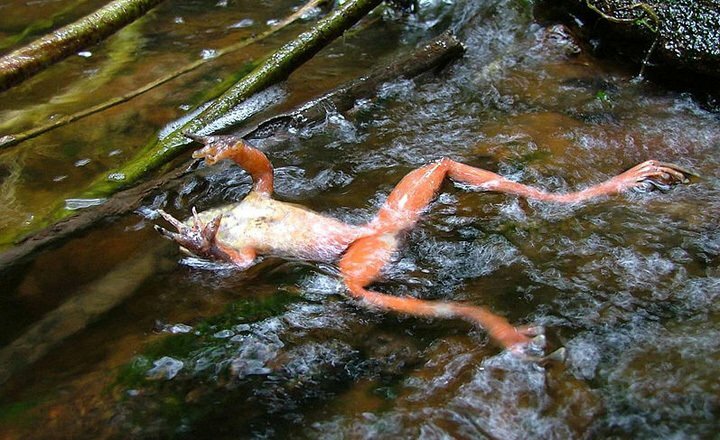 True story, if the frog was a sharp-snouted torrent frog, gastric brooding frog, southern day frog of Australia or one of the stream-breeding toads of Central and South America – all now extinct because of Bd. Karthikeyan Vasudevan’s lab in the Laboratory for the CONservation of Endangered Species (LaCONES), Centre for Cellular and Molecular Biology (CCMB), Hyderabad, recently documented the status of Bd, the frog pathogen that causes the fungal disease chytridiomycosis, in India’s biodiversity hotspots. This first-ever nationwide survey reports that Bd does occur in Indian frog populations but with low disease prevalence and high haplotype diversity. Unlike human skin, frog skin is thin, permeable to water and electrolytes, and helps frogs breathe. Infection with Bd causes the frog’s skin to thicken several folds making it impermeable. Frogs become lethargic, adopt abnormal postures with their hind limbs extended and lose their righting reflex when placed upside down. Within a few weeks of the infection, frogs die of osmotic imbalance and cardiac arrest. Several species of frogs have been pushed to the brink of extinction by Bd worldwide, but very little was known until now about its status in the frog populations of India. “With over 375 different species of frogs, most of which are endemic, the stakes were high for India,” said Vasudevan. Vasudevan and his team tested 1870 frogs from the biodiversity hotspots in India. Each frog was arduously hand-caught and stroked 70 times with a cotton swab to collect the fungal spores on its body. After an examination for clinical symptoms, the frogs were released into the wild, and the swabs brought back to the lab. About 8% of the frogs were positive for Bd suggesting that India is a ‘cold spot’, a region with a low prevalence of the disease. While this is good news, it is also exciting because cold spots are valuable for understanding the disease and finding solutions for its treatment. An interesting feature of cold spots is that they harbour multiple endemic haplotypes of the pathogen, which may have evolved due to host-pathogen co-evolution. 80% of the Bd haplotypes identified by Vasudevan’s group were endemic or unique to India. Identifying and monitoring different haplotypes with sensitive assays is vital for understanding the dynamics of the disease. However, the researchers found that current assays failed to detect many endemic haplotypes and need to be improved. Just like lions, wolves and elephants, frogs are an important part of our ecosystem. 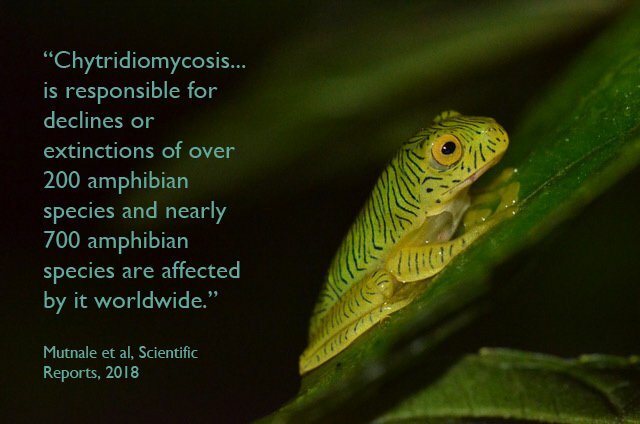 “The low prevalence of Chytridiomycosis gives us a little respite,” said Abhijit Das from the Wildlife Institute of India, Dehradun, who was not associated with this study, “However, with the ongoing climate change, the situation may switch. We need more sampling and monitoring of Bd status, especially in our protected areas”. With a success rate of about one in five, capturing these nocturnal creatures isn’t an easy task. Milind Mutnale and Lilly Eluvathingal, two of the researchers who conducted this study, have several exciting stories born out of their fieldwork. “When you are out in the wild, you surprise the animals first,” said Lilly. Encountering a wild elephant immediately calls for abandoning plans and quietly backing away from the area. “It’s hard, because as a researcher one wants every data from every site. But always, safety first!” said Lilly. The lab is now interested in monitoring the persistence of Bd throughout a frog’s lifespan and studying the influence of frog skin secretions and its resident microbiome on the infection. For anyone interested in checking in on the frog in their backyard, LaCONES offers Bd diagnostic services. Fathima has a PhD in Life Sciences specializing in Cell and Molecular Biology. She is a freelance writer for Science Communication.